If you're willing to look beyond the current bear market in the energy space, oilfield-services stocks seem to be presenting a solid long-term investment opportunity. Last year's dramatic oil-price collapse triggered a bear market in the oil industry, and oilfield-services stocks weren't spared either. With significant uncertainty still encompassing oil prices, investors are obviously vary of getting burned again. On the other hand, if you're an investor who takes the long-term view, then investing your money in oilfield-services stocks may not be a bad option. 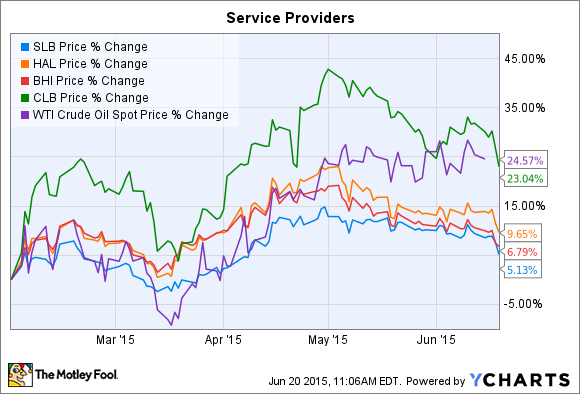 Of course, oil prices will continue to play a major role in the performance of these stocks. That said, there are some crucial factors you must look into before investing in oilfield-services companies. But before that, let's get a hold of the current situation in the oil markets. At the root of the oil-price dive is the fundamental shift in the global crude supply and-demand dynamics. The world is currently witnessing a crude-oil surplus, as international demand growth remains sluggish against a resurgent supply led by ballooning oil production in the United States. However, traditional oil-producing giants in the Middle East, Africa, and South America -- which form the members of the cartel OPEC -- haven't been taking things lying down. OPEC intends to push high-cost producers out of the game by keeping its overall production quota of 30 million barrels per day unchanged and in the process maintain its global market share. Despite relatively lower oil prices, the cartel, which uses conventional drilling techniques, has the ability to maintain its current production rate, as its overall production costs per barrel are still lower than current prices. On the other hand, the long-term marginal cost of U.S. shale oil is between $40 and $50 per barrel, according to analysts. Keeping the current situation in mind, let's see how we can invest in oilfield-services companies. Conventional oil production in the Middle East, Africa, and Latin America will probably be at the lower end of the cost curve. And with OPEC intent on maintaining its current production volumes, oilfield-services companies with higher exposure to these regions will be at lower risk of losing out on business opportunities. Again, that needs to be taken with a grain of salt: Geopolitical tensions in the Middle East can always wreak havoc. However, chances are these incidents are most likely to be isolated to a particular region that won't affect production output. For example, Iraq managed to maintain and even increase its crude-oil output despite violent sectarian clashes. The best example fulfilling the above criteria would be Schlumberger (NYSE: SLB). The Curacao-registered, Houston-based services giant has a solid exposure to international operations in addition to holding a competitive position in the North American market. For the first quarter of 2015, international operations constituted a solid 69% of total revenue. It's also interesting to note that Schlumberger's stock was the most resilient among its peers-- that is if we exclude Baker Hughes (NYSE: BHI) price jump on the news of its acquisition by Halliburton (NYSE: HAL) --during the oil-price carnage between last July and January 2015. The current oversupply in global inventories will most likely put the brakes on the runaway growth in North American oil production. The massive 60% drop in the U.S. oil-rig count since last November stands as evidence. That said, U.S. shale-oil producers will want to somehow maintain current production volumes, if not increase further. The primary reason is that most producers are highly leveraged and are desperate for cash flows -- even if the cost of production turns uneconomic. Again, the evidence lies in U.S. oil production still at an all-time high, crossing 9.5 million barrels per day. That's why the best and the biggest of North American oilfield-service providers will continue to do big business while lower placed rivals could falter. And this is where Halliburton and Baker Hughes come in. Once their proposed merger gets through, the combined entity will become the largest service provider in North America. A larger full services entity can offer a complete services package to exploration and production companies which, in turn, would also be more cost efficient. Fellow Fool Matt DiLallo has an interesting analysis on the proposed merger. Schlumberger follows at a close second and will continue to thrive as well, creating a solid competitive environment. If you're willing to look beyond the current bear market in the energy space, oilfield-services stocks seem to be presenting a solid long-term investment opportunity now. The biggest reason? 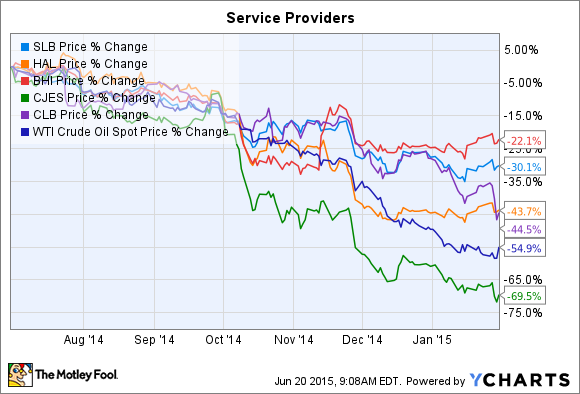 In the long run, oil prices will have little to no correlation with oilfield-services stocks. Instead, business fundamentals should drive value for these companies, which is why the current carnage could be suggesting that these stocks might be trading cheap enough for a value investor to jump in.